The conclusion of a major junior tournament evokes a variety of emotions, because as much fun as it is to watch the championships unfold, it can be exhausting. The US Open seems to offer twice as much of both, so I hope to get an opportunity to catch up on my sleep this week. I am planning a recap of the US Open Junior Championships and the American Collegiate Invitational for Tennis Recruiting Network in the upcoming weeks, as well as an interview with agent Sam Duvall of Topnotch Management, which I conducted last week in New York. I'll also be posting some quotes from all 16 players who competed in the American Collegiate Invitational. Last year I did that as well, with the women's update here, and the men's update here. So, plenty to keep me busy in the next several weeks before October's Pan American Closed in Tulsa. The NCAA announced today that it was moving seven championships out of the state of North Carolina due to "the cumulative actions taken by the state concerning civil rights protections." The NCAA Division III Tennis National Championships, which were to be held in Cary, North Carolina next May, are among those championships being relocated. The NCAA's release says the new locations will be determined soon. I immediately thought of the USTA's new campus in Lake Nona, perhaps because I went to a press conference about it last week at the US Open, and the 12-court college area, plus six indoor courts looked impressive. That's pure speculation on my part however, with the more likely relocation being to a previous host on a Division III campus. After quite a few years with no young players, especially men, breaking through quickly from the juniors to the ATP level, the pendulum has swung in the other direction, with Borna Coric, Nick Kyrgios, Sasha Zverev, Hyeon Chung and Taylor Fritz moving rapidly through the Challenger ranks and into the Top 100. With Denis Shapovalov's recent surge and Frances Tiafoe's steady progress that trend continues, and yesterday another name was added to the mix, with 17-year-old Casper Ruud winning the €42,500+H ATP Challenger in Seville Spain as a qualifier, his first Challenger tournament. Ruud, a former ITF No. 1 junior who played Wimbledon and the French Open Juniors this year, had won two Futures titles and made the final of three others this year. The ATP Challenger article on Ruud's surprise title says he is the fourth youngest player to win a Challenger title in his first attempt. The USTA Pro Circuit, which takes a break every year for the US Open, is back up and running this week $25,000 women's tournament in Lubbock, Texas, a $50,000 women's tournament in Atlanta, Georgia a $50,000+H Challenger in Cary, North Carolina(hmmm) and a $10,000 Futures in Claremont, California. Tonight in Cary, Kalamazoo champion Michael Mmoh got his second Challenger-level win of the year, beating Tommy Paul 5-7, 6-2, 6-4 in a first round match. If Frances Tiafoe beats qualifier Ryan Haviland tomorrow, Mmoh and Tiafoe, close friends and frequent doubles partners in their junior days, will face off for the second time in a pro event with Tiafoe having won the previous encounter at the Sarasota Challenger 6-2, 7-6(0). While I was busy at the US Open, several American juniors picked up titles at ITF Junior events in Central America. William Woodall, who won the doubles title three weeks ago at the Grade 1 in College Park, went straight from Maryland to Panama and took the singles title at the Grade 5 there, his first on the ITF junior circuit. 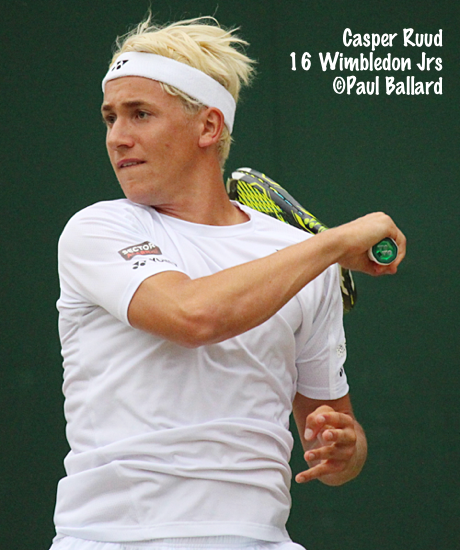 The 16-year-old, seeded No. 4, defeated unseeded Diego Giraldo Restrepo of Colombia 4-6, 6-2, 6-2 in the final. Fourteen-year-old Lauren Stein swept the singles and doubles titles in Panama, winning the singles title with a 7-6(5), 6-2 win over Imani Graham. Stein was seeded fourth and Graham third. Graham and Stein teamed up for the doubles win, with the No. 2 seeds beating top seeds Katarina Drazic of Serbia and Rhea Verman of India 6-2, 2-6, 10-8 in the final. Stein had reached the singles final of a Grade 5 earlier this summer, but Panama was her first title. At last week's Grade 5 in Honduras, No. 3 seed Joshua Bode won an all-American final, beating unseeded Brandon Freestone 6-2, 6-3 in the final. It was the first singles title for the 16-year-old from Florida. Jared Donaldson is into the top 100 as a teenager too after his excellent few weeks. For some reason, he doesn't seem to get the same level of media coverage as the other American teenagers, but that's still a very great achievement for a teenager. Colette, it looks like the ACC is aligning to the NCAA and moving it's neutral site championships from NC for the same reason. That would impact the Men's and Women's ACC championships in Cary, NC. How many years has it been held in Cary? For as long as I can remember. That's too bad, it was a great site for that event.